In business, spreadsheet software like Microsoft® Excel is often the first choice for modeling problems. Now, spreadsheets are often very intuitive, but they can be limited in what they can ultimately do for large-scale problems. If you’re a developer, you might find it more expedient simply to write a script to solve a modeling problem, because then you can easily integrate the script into other systems. This article introduces the basics of linear optimization in Python using the Pyomo library. You might be familiar with algebraic modeling languages such as AMPL, AIMMS, and GAMS. The advantage of using Pyomo is that its modeling objects are embedded within a high-level programming language with a rich set of supporting libraries. Another key advantage to doing scientific or mathematical computing in Python is that the language can easily translate algebraic notation into an expression in code. In addition, there are many mature libraries you can leverage. An example is NumPy (see the Resources section), a library that provides additional data structures such as a multi-dimensional array. The NumPy library is used in a code example later in the article because it answers the requirement for a multi-dimensional data structure. To start, install Pyomo. Pyomo is a central component of Coopr, a collection of Python software packages. Download the coopr_install script, which creates a Python virtual environment when you run it with the Python interpreter. Pyomo assumes you have at least one solver installed. The GNU Linear Programming Kit (glpk) is the default. Refer to the installation instructions for the solver you want to use. Then make sure Pyomo is able to find this solver on its path. There are two ways to create a data model with Pyomo: Abstract and concrete. The key difference is whether to separate the model and the data. In an abstract model, you separate the model and the data. In a concrete model, you define the data inside the model itself. For example, in a Pyomo script that uses a concrete model, everything is defined inside a single script file. For simpler problems, especially teaching problems, this can be an efficient approach. On the other hand, larger problems often have larger data sets, which makes it impractical to embed the data in the same script as the code needed to work on the data. At a high level, a Pyomo model consists of variables, objectives, and constraints. Variables are values that are calculated during the optimization. Objective are Python functions that take data and variables, and is either maximized or minimized. Constraints are a way of defining an expression that limits the values a variable can assume. To illustrate a simple linear optimization problem using Pyomo, let’s take a product-mix problem from the book Introduction to Management Science (see the Resources section). The Wyndor factory produces doors and windows. Each of three plants with different available hours can produce either doors or windows. To determine how to maximize the profit available in the limited amount of hours of production, write the following script. It has three main sections: model, objective, and constraint. The model — it’s a concrete model — instantiates the data of the problem, such as the hours available from plants. The objective (which can be either to maximize or minimize) is to maximize profit. The constraint uses a CapacityRule function, written using a Python idiom called list comprehension. inside of the virtual environment. From this output, you see that producing six windows and two doors gives you a profit maximization of $3,600. Another way you can solve the script is to use Python because of the conditional statement added. This invokes Pyomo inside of the script, instead of using Pyomo to invoke the script. The book In Pursuit of the Traveling Salesman: Mathematics at the Limits of Computation by Bill Cook contains a great example of a problem that doesn’t always scale well as a linear program. It’s the Traveling Salesman Problem, or TSP: Given a list of cities, find the shortest possible route that visits each city exactly once and returns to the original city. 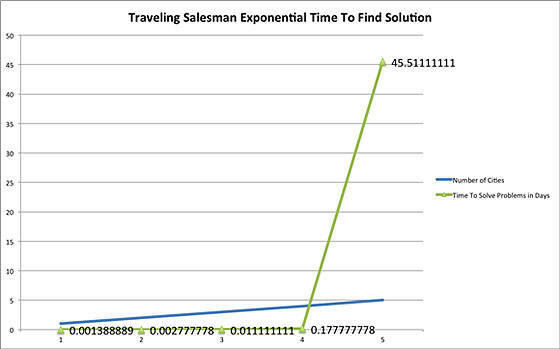 The worst-case running time that solves the traveling salesman problem increases exponentially with the number of cities. Figure 2 is a graph that simulates the amount of time necessary to solve for every possible route, assuming it takes a few seconds to solve for a couple of cities. As you can see, it rapidly becomes impossible to solve the problem in your lifetime. You need another strategy to find a good result. Often a good, but not a guaranteed optimal, solution is achieved by running simulations and then taking the best results of those simulations. An example of this approach is shown in the Python code below. Randomly select a starting city, and then greedily select the next city with the shortest distance. This simulation can then be run N, or multiple times, and the shortest path among the simulations will be run. """Returns a randomized city to start trip"""
"""Sort the list by distance and return shortest distance route"""
"""Select the next path to travel based on the shortest, nearest path"""
The TSP script uses a NumPy multi-dimensional array as the source of data. If you want to run this example, you need to install NumPy (see the Resources section). The array is defined in a file called routes.py. Here is what those routes look like. In this article, I covered the basics of doing optimization with Pyomo and Python. This should be enough to get you started on your own. In the next two articles in this series, I walk through some more detailed examples and cover some pragmatic aspects of building larger programs and dealing with scaling issues. Special thanks to Dr. David L. Woodruff for reviewing this article. Pyomo – Optimization Modeling in Python Pyomo – Optimization Modeling in Python, by W. E. Hart et al. Introduction to Management Science: A Modeling and Case Studies Approach with Spreadsheets Introduction to Management Science: A Modeling and Case Studies Approach with Spreadsheets, by David Anderson et al. Pyomo installer Pyomo is a central component of Coopr, a collection of Python software packages. Download the Pyomo installer. the Virtual Python Environment builder (virtualenv) Download the Virtual Python Environment builder (virtualenv). NumPy Read about and download NumPy, the fundamental package for scientific computing with Python. GLPK (GNU Linear Programming Kit) package Download the GLPK (GNU Linear Programming Kit) package, used to solve large-scale linear programming (LP), mixed integer programming (MIP), and other related problems. Pyomo mailing list. Join the discussion at the Pyomo mailing list. Modeling Languages in Mathematical Optimization Learn more about modeling and solving real world optimization problems in the book Modeling Languages in Mathematical Optimization, edited by Joseph Kallrath. In Pursuit of the Traveling Salesman: Mathematics at the Limits of Computation In the book In Pursuit of the Traveling Salesman: Mathematics at the Limits of Computation, the author William J. Cook explores the various algorithms and branches of mathematics used to solve the traveling salesman problem, including the branch of mathematics known as linear programming. notation examples from Dr. David L. Woodruff Study some notation examples from Dr. David L. Woodruff.